Say YES to Body Liberation. Your body is your temple—the Sacred home that carries you through your life journey… the only one you have this time around, right? Yet, we often spend life fighting the body, abusing it, and hating ourselves for being seen inside a skin that isn’t perfect—sculpted of muscles and fat in just the right proportion, gender correct, smelling nice, no wrinkles, no rolls, no frizz…and on and on. You may know this torture chamber of negative self-talk. And if so, only YOU can stop the war with your body! 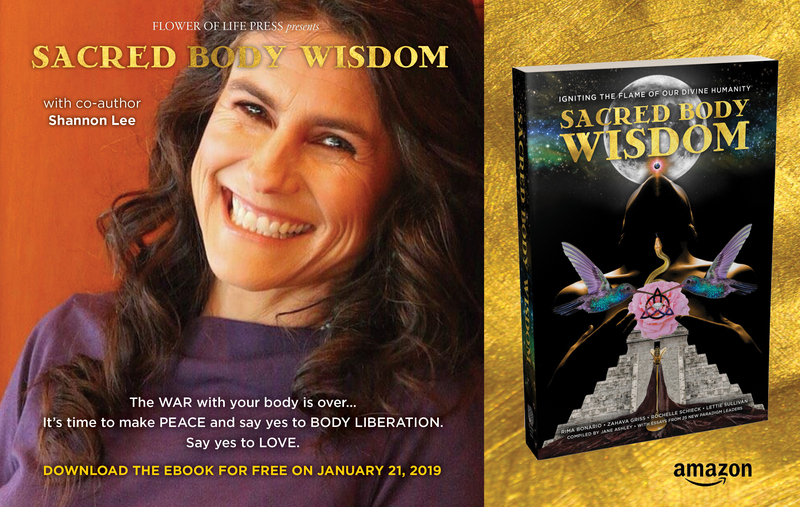 Flower of Life Press proudly presents Sacred Body Wisdom: Igniting the Flame of Our Divine Humanity—a powerful collection of the voices of change, featuring authors Shannon Lee Nickerson, Rochelle Schieck, Zahava Griss, Lettie Sullivan, and Rima Bonario, plus contributions from 16 new paradigm leaders. By making peace with your body and treating it with unconditional love and respect, you will discover the heart of your own Sacred Body Wisdom. Say YES to Body Liberation. Say YES to love.